We are happy to post information on open positions for North Carolina journalism educators here. Advisers may receive Continuing Education Units (CEUs) for participating in the N.C. Scholastic Media Institute and certificates of Participation and Attendance in regional workshops. 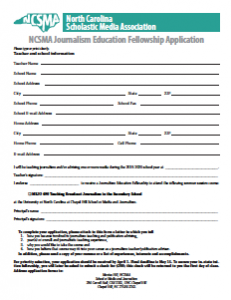 N.C. high school journalism teachers may apply for a journalism endorsement to their N.C. license with 18 hours of relevant coursework. NCSMA offers annual fellowships to N.C. advisers to help them offset summer course expenses. Designed to cover full tuition and lodging expenses for each adviser, the fellowships are application-based. The program allows teachers to enroll in a one-week, short-term summer course with tuition funding provided by NCSMA. 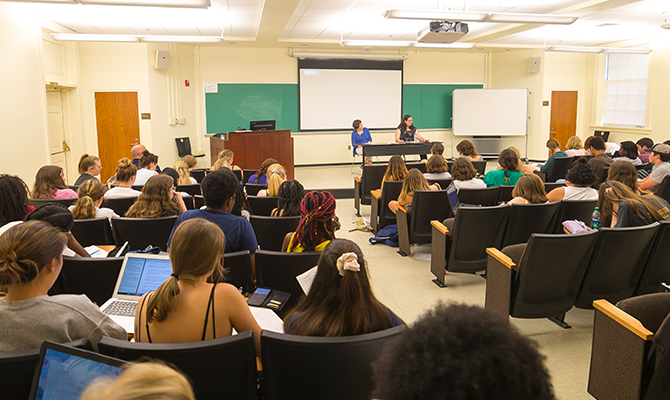 N.C. journalism teachers and media advisers can qualify for free in-state tuition, lodging and books through this program. The fellowships, awarded on a first-come, first-served basis, are valued at $1,230 per person. Note: The 2019 summer session course offered will be MEJO 490: Teaching Broadcast Journalism in the Secondary School. Priority deadline for applications is April 1. Course dates are July 7 to 13. The Columbia Scholastic Press Association is an international student press association that provides student journalists and faculty advisers with workshops and conventions, opportunities to submit student work in contests and idea exchanges in order to promote journalistic values. JEA supports scholastic journalism by providing students and advisers with resources and educational opportunities. Resources include lesson plans, certification, curriculum development, mentoring and more. The National Issues Forums develops guides and resources for teachers and educators in order to address and engage with controversial issues. Resources include issue guides, starter videos, reports, worksheets, lesson plans and more. NSPA is a non-profit educational association that provides education services to students, teachers and advisers. NSPA oversees middle and high schools while the Associated Collegiate Press oversees colleges, universities, professional schools and technical schools. Both provide students and advisers with media critiques, education materials, training programs and more. Quill and Scroll serves as an international honor society with the mission of promoting high school journalism. Quill and Scroll supports students and advisers through evaluation services, contests and critiques, scholarships and more. SIPA provides students and educators with resources, including general support, publications, programs, contests and scholarships to promote journalistic values and freedoms. SIPA also hosts the Carolina Journalism Institute which is a four-day summer institute that provides students and advisers with advanced journalistic techniques. SPLC provides advisers with legal resources; lesson plans; handouts and articles from superintendents, former teachers and other officials on journalism topics. It also suggests professional associations to join and email lists to sign up for.